We have already studied in chapter 5 that the chlorination of an alkene provides 1, 2-dichloroalkane. In contrast to this, the addition of chlorine to benzene occurs through numerous difficulties and produces numerous isomers of 1, 2, 3, 4, 5, 6-hexachlorocyclohexanes. When treated through chlorine or bromine in the existence of sunlight, benzene forms the hex halides, C6H6Cl6 and C6H6Br6, correspondingly. The addition reaction continues via the free radical mechanism. The 1,2,3,4,5,6- hexachlorocyclohexane, theoretically can exist in eight stereoisomeric forms but only seven of these are known. One of the isomers, identified as Gammexane, is an influential insecticide. It is extremely constant and acts more rapidly than D.D.T. All of the isomers have given to exist in the chair form. Hydrogenation of benzene at higher temperature and under pressure yields cyclohexane. Even though benzene isn't diminished through metal and acid, or via sodium in ethanol, it is decreased via sodium in liquid ammonia in the occurrence of ethanol (Birch reduction) to give 1, 4-dihydrobenzene (cyclohexa-l, 4-diene). This reaction has as well been given to have a free radical mechanism. Lithium in anhydrous ethylamine, though, decreases benzene to cyclohexene and cyclohexane. Manage the position of attack through choosing the proper reaction situations. Halogenation of alkanes entails condition under that halogen atoms are shaped through homolyses of halogen molecules, which is, elevated temperature or light. Halogenation of benzene, on the other hand, includes shift of positive halogen that is promoted via Lewis acid catalyst like ferric chloride. We can ask why it is so. This is since the bond dissociation energy of benzylic C- H.
Because the benzylic radical formed is more stable, 1-chloro-1-phenylethane is the major product. Even though benzene and alkanes are fairly unreactive towards the common oxidizing agents (KMnO4, K2Cr2O7 etc), the benzene ring renders an aliphatic side chain quite susceptible to oxidation. The side chain, irrespective of its length, is oxidized to a carboxyl group (-COOH). 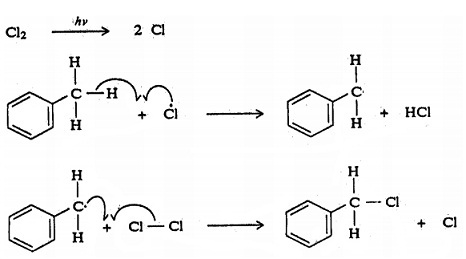 Tertiary alkyl reserved aromatic compounds don't follow this reaction. For example, toluene, propylbenzene, (1-methylethyl) benzene are oxidized to benzoic acid in higher yields. 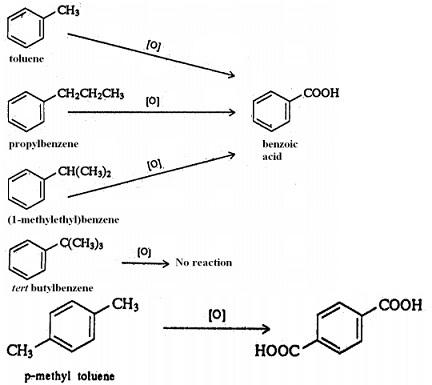 P-Methyltoluene on oxidation provides terephthalic (benzene-1, 4-dicarboxylic) acid but tertiary butyl benzene is not affected. 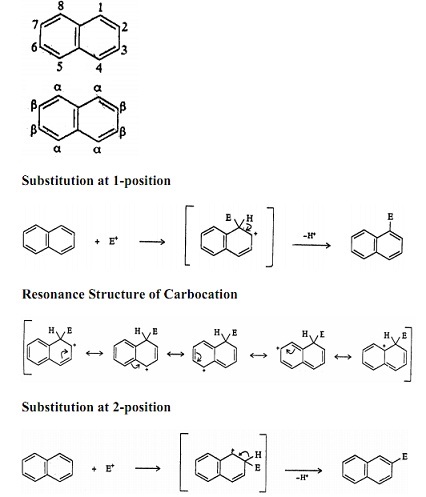 The numeral and the location of the carboxylic groups generated signify the number and position of alkyl chain connected to the aromatic ring. Polynuclear hydrocarbon is an assembly of more than one benzene ring in the molecule. Depending upon the mode of attachment of various rings, the polynuclear aromatic hydrocarbons may be classified into two broad classes: (i) isolated benzenoid hydrocarbon, and (ii) condensed or fused benzenoid hydrocarbons. I. Isolated benzenoid hydrocarbon: In isolated systems, two or more rings are connected to each other either directly or through carbon chain. Several general instances are biphenyl, diphenylmethane and triphenylmethane. II. Condensed or Fused Benzenoid Hydrocarbon: The condensed or fused benzenoid hydrocarbons are those in which two or more benzene rings are fused together at the ortho position in such a way that each pair of rings shares two carbons. They contain compounds as naphthalene, anthracene; phenanthrene etc. The condensed polynuclear is via far the larger and the more significant group. A large number of them have been found to possess carcinogenic (cancer producing) activity. In this unit we will discuss the chemistry of naphthalene only. Naphthalene is the parent compound of polynuclear hydrocarbons. Naphthalene, m.p. 355 K, is a colourless volatile crystalline solid. Naphthalene has three resonance hybrid structures. The bonds aren't all of similar length, but are close to the benzene value of 139.7 p.m. How can we clarify the aromaticity of naphthalene? The above structure of naphthalene shows that it has 10 π electrons and 10 is the Huckel number which indicates that naphthalene should be an aromatic molecule. Electrophilic Substitution of Naphthalene: Polynuclear hydrocarbons are more reactive towards electrophilic attack than benzene. 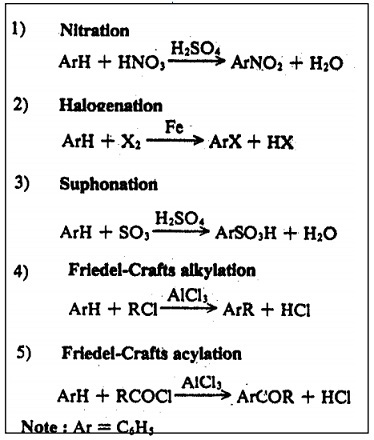 Naphthalene undergoes a number of usual electrophilic substitution reactions, such as nitration, halogenation, sulphonation, Friedel-Crafts alkylation, Friedel-Crafts acylation, etc. 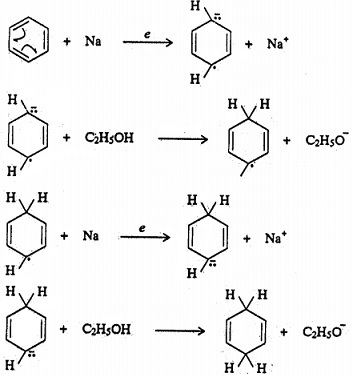 The method for naphthalene substitution reaction is similar to that of benzene substitution. The 1st substituent goes to 1-position (α -position); that denotes, the 1-position is more reactive than the 2-position (β -position). We can ask why it is so. To comprehend this, let us examine the resonance structures of the 2 intermediate carbocations effecting from the particular attacks. In both cases, the positive charge can be allocated to 5 different positions, but such carbocations aren't the same in energy. In the 1st case, the first two structures have their benzene ring intact and are consequently more stable than the continuing three structures. 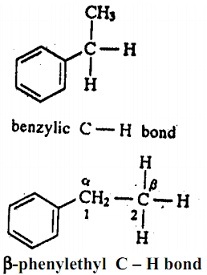 In the 2nd case, only one resonance structure has a benzenoid ring intact. The resulting resonance hybrid has higher energy in the 2nd case than in the first case. 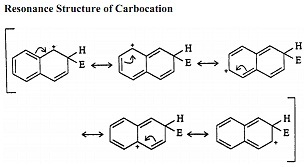 The middle carbocation in the 1st case is more stabilized via resonance, and its conversion state is of lower energy. For this cause, the intermediate in the 1st case is shaped faster and 1-position is more reactive. Oxidation and Reduction of Naphthalene: Under managed conditions, naphthalene is oxidized to 1, 4-naphthoquinone, but the yield is generally low. More vigorous oxidation results in the loss of one ring and yields phthatic anhydride. This reaction probably continues through the formation of ortho-phthatic acid. Unlike benzene, naphthalene can be partially hydrogenated with no heat and pressure, or that can be decreased through sodium and ethanol. For entire hydrogenation of naphthalene, it needs heat and pressure just as in the case of benzene.